Arguments break out over the strangest things. I once heard a famous actress describing how a domestic row had been sparked off by a milk bottle. A milk bottle? Well, I can do better. My trigger was an egg. It’s not so much the object that ignites the row, but the circumstances. In this case, it was Christmas – the first with the man who was to become my husband. I was going to treat him to a traditional Christmas. The best he had ever had. Single-handedly, I was going to make the puddings, cook the cake, fill the stockings and decorate the tree. It was all going to be perfect: a Nigella-fest of soft lighting, glittering decorations, mulled wine and wonderful food. I pictured myself at the centre of the festivities: a calm, unflappable Maitresse d’, conducting proceedings which would, naturally, run like clockwork. But life’s not like that. Organising Christmas is like trying to restrain a rushing torrent. It has a habit of swamping you. It was a discovery that nearly cost me my future marriage. I remember it well. I was in the kitchen stirring, measuring, chopping and generally busying myself with preparations for the Christmas cake. I don’t even like fruit cake but I had to make it. It was traditional. Following my Good Housekeeping recipe to the letter, I had just started to add the wet ingredients to the dry when I noticed that I was an egg short. Perhaps I could get away with two eggs rather than three. “What do you think?” I shouted upstairs to where my boyfriend was trying out a new drill. “Well, if the recipe says three, it means three,” he replied, unwisely. So, I asked him – quite reasonably – to nip along to the shops and get some more eggs. He was reluctant. His excuse being that he hadn’t quite finished drilling the socket/widget/thingy that was so important. I marched around the kitchen harrumphing, checking my watch every thirty seconds. I couldn’t go to the shops myself because, by this time, I was encrusted in flour, egg and candied peel disgorged by the food-mixer. Unlike Nigella’s perfect make-up, I was covered in an unbecoming pebble-dash which had spread all over my face and up into my hair. I would need a full hose-down in the shower and a clean change of clothes if I was to go out. He had to do it. There was still no movement upstairs except for the incessant sound of drilling. I tried to picture what our bedroom wall would look like when he’d finished. The only image that sprang to mind was the aftermath of a mafia shoot-out. Trying to rein in my rising temper, I decided to warm the oven. It was new, shiny … and obdurate. I got the lights to work, but no heat. It didn’t matter how much I fiddled, nothing worked. Finally, in a fit of pique, I pressed all the buttons at once. There was a sort of ‘pop’ and all the lights in the house went out. A voice drifted down from the darkened stairwell. Trying to hide my mounting panic, I decided that attack was the best form of defence. And so I did. With a bowlful of raw, half-mixed Christmas cake sitting on the passenger seat beside me. 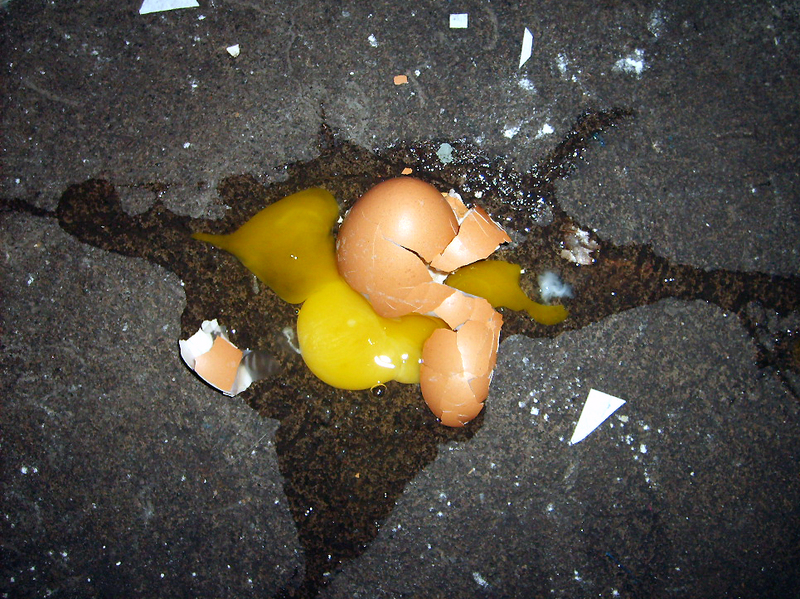 That egg – or the lack of it – nearly ended our relationship. Since then, I’ve abandoned all Nigella aspirations. The perfect Christmas is a mirage; a last vestige of childhood. But having rejected this bit of adult make-believe, I’ve actually begun to enjoy myself. I buy mince pies and cheat with the bread-pudding mix. (The packet variety is brilliant). However, I’m not completely cured. This Christmas, we’re going to make a cake – together. So, I’m off to buy eggs and hide the cordless-drill! This entry was posted in 12 days of Christmas, bread pudding, Christmas, Christmas cake, Christmas pudding, cookery, cooking, Food, Humour, mince pies, Nigella, Relationships, writing and tagged 12 days of Christmas, Christmas, Christmas pudding, cookery, cooking, Humour, mince pies, Relationships. Bookmark the permalink.